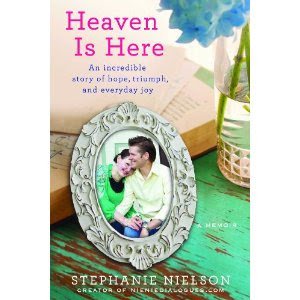 I learned about Stephanie Nielson a couple years back after being told to watch this short video about her story. I followed her blog periodically and enjoyed her straight from the heart approach to writing and sharing about her life. When I saw that her book came out I quickly hopped onto Amazon and ordered it. After it arrived I skipped the nap I would normally take while The Monkey was down and couldn't stop reading. I stayed up late a couple nights and just plowed through it. I like to read, but I don't read a lot because it usually just makes me fall asleep. Not the case with this read. I was hooked from the first page. I had a cheesy smile on my face through the first part of her story as it felt like a sweet romance novel (not the trashy kind, of course). I shed tears as she shared her horrific experience crashing, waking up, and enduring all that comes with having 80% of your body burned. My faith and hope in God, people, and the miracle of the human body was strengthened as I finished the last page and pondered on all that I just read. I am grateful to those who share their challenges, sorrows, and heartaches so that I can be humbled, strengthened, and lifted above my own life's so-called problems. Thank you Stephanie for sharing your story. And thanks to all of you who endure life's challenges with faith, hope, and encourage. People look to you more than you realize.